Most of us can’t attend every single wedding we’re invited to because of financial strain, scheduling conflicts, or other legit reasons. And that’s totally okay! However, sometimes we get an invite to someone’s nuptials and we’re just not up for it (no matter how much we love the happy couple). While there are plenty of valid reasons to bow out of a big day, the following excuses just don’t justify the decision to decline. 1. You’re not interested in traveling to the city in which the wedding is being held. 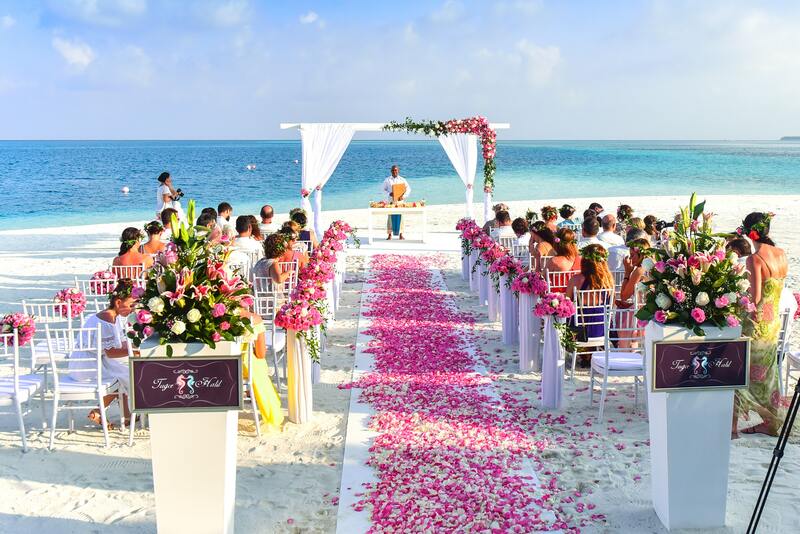 While it’s certainly exciting to have an excuse to jet off to New York City, or Napa, or the Maldives, chances are that many of your friends and family members will be getting hitched in far less chic locales. Not being able to afford to travel is one thing, but skipping someone’s big day because you’d rather not hop on a plane to, say North Dakota, is quite another. 2. They didn’t go to yours. It’s totally normal to feel slighted if someone missed your wedding—especially if it seems like he or she simply chose not to be there for no apparent reason. But rather than trying to settle the score for bowing out of yours, try to give them the benefit of the doubt. Maybe they couldn’t afford to come, or they were having relationship issues, or there was a family emergency that caused them to miss your celebration and they just didn’t want to say so. If this is a friendship worth maintaining, don’t skip the wedding just to give them a taste of their own medicine. 3. You’re holding a grudge for another reason. Being angry at someone is no reason to skip their wedding, unless the person did something terrible to you—in which case they probably wouldn’t have included you in the first place, right?! Maybe you didn’t get asked to be in the bridal party, or you’re still stewing over a situation from the past. Don’t let whatever it is cause you to lose sight of the relationship you have with the person or the couple or use their wedding a way to twist the knife. 4. You didn’t get a plus one. Due to budget constraints or personal preference, many couples follow rules like “only those who live together” or “only people we’ve actually met” when trying to manage couples on their guest lists. Try not to take it personally, and put on your dancing shoes anyway! At the end of the day, you go to weddings to celebrate your friends’ or family members’ love and commitment, not to spend an evening with your partner. Plus, if these are close friends or family, you will likely know other people at the wedding who are in the same boat as you. 5. You’re feeling not-so-awesome about your single status. When everyone else you know seems to be getting hitched in rapid succession, the last thing you want to do is go to all of their weddings… alone. But, one day, it will be your turn. And you will want all of these happy couples to celebrate you at your nuptials. So, support them. And put your feelings of jealousy aside, as hard as it might be!